Affiliate marketing is one of the best ways to make money online. You can make money several ways with affiliate programs. You can make money from your current traffic by talking about products that you like. You can also create your own affiliate programs to have others sell your products for you. It makes sense to integrate affiliate programs into your WordPress website. Fortunately, it isn’t that difficult to manage affiliate programs from your WordPress website. In this article, we’ll look at the 13 best WordPress affiliate plugins. Many have both a free and a pro version. I’m providing the prices for the starting pro version. They’re in no particular order. ThirstyAffiliates adds a few links to the WordPress editor so you can add affiliate links. You create the links in a dashboard. Adding the links works the same way as adding any link. Click the button and search for your link. Select it and click to add. Group your links into categories. Add images for affiliate links. It has safe redirects and smart uncloaking. It also includes reports and statistics so you can track your affiliate link clicks. It has a free and a pro version. AffiliateWP is an affiliate system with lots of add-ons and features to choose from. It includes lots of tools such as referral tracking, coupon tracking, affiliate management, real-time reporting, eCommerce integration, automation, referral rate types, etc. It also includes email tools, cookie expiration, exporting, developer APIs, shortcodes to place forms and links, and more. View logs and export your data to CSV. It’s easy to set up and use. Affiliates Manager lets you create your own affiliate programs. It integrates with the popular eCommerce plugins and makes it easy to facilitate affiliate recruitment, registration, login, and management. It will track referrals and provide real-time reporting. You can set the affiliate rates and set the payout for automatic or manual payments through PayPal. You can have unlimited affiliates and ads. Easy Affiliate Links lets you manage all of your affiliate links. You can create cloaked links or leave specific links uncloaked for compatibility with Amazon. You can assign categories to your links. Import or export, and track monthly or lifetimes clicks. You can get premium add-ons for statistics, geo-specific links, A/B testing to test the text for your links, and a broken links checker. Auto Affiliate Links automatically adds affiliate links to your content. It connects your content to affiliate programs such as Clickbank, Shareasale, Commission Junction, Amazon, eBay, Walmart, BestBuy, and the Envato Marketplace. It doesn’t modify your content. Instead, the links are added when your content is displayed. It includes an admin panel where you can make all of your adjustments. You can set the links to follow or nofollow, choose the keywords that have links, limit the number of links that are shown, and set the links to be cloaked if you want. Ultimate Affiliate Pro lets you set up your own affiliate programs and manage them. Set up a multi-level-marketing (MLM) strategy where your affiliates create their own campaigns. You can set up different rewards and amounts based on ranks and special offers. It includes ranks with achievements and performance bonuses. It provides complete metrics on 8 different types of costs. Set commissions for lifetime if you want and recurring referrals. Set up payouts with PayPal and Stripe. It includes lots of integrations, coupons, notifications, QR codes, friendly affiliate links, reports, and lots more. Affiliates has both a free and a pro edition that helps you run an affiliate marketing program. Manage unlimited affiliates and integrates them into any type of platform including eCommerce, memberships, lead generation, and more. Commissions are built in so you don’t have to manage them. Use the shortcodes to create pages that provide affiliates with their performance information. It also includes a partner referral program for multi-level-marketing. It includes lots of integrations and extensions for popular eCommerce platforms and forms plugins. AdSanity makes it easy to insert self-hosting and network ads anywhere on your website. It provides lots of display options including shortcodes, widgets, and template tags. Publishing options include infinite and date-based and you can set the dates for the individual ads. Graphical stats show your stats on a per-ad basis so you can see the individual ad performance. You can set the date range for the stats. It has lots of add-ons available to detect ad-blocking software, display them based on conditions, Google Analytics, custom ad sizes, widgets, and more. 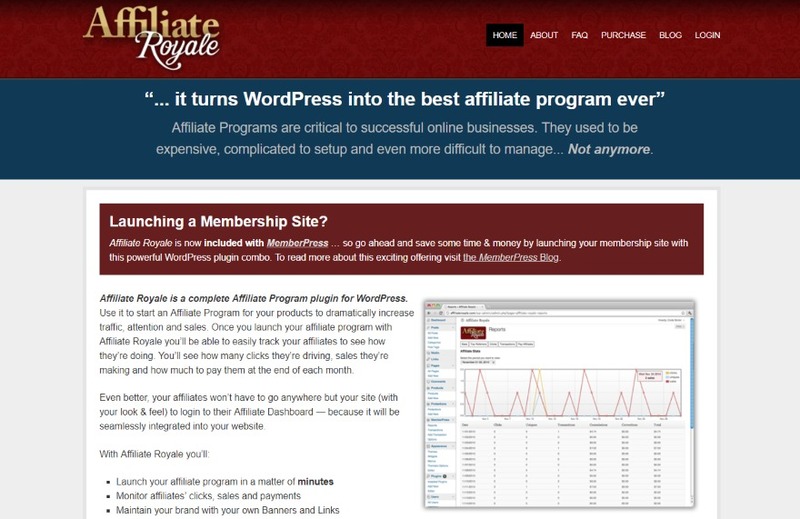 Affiliate Royale makes it easy to create affiliate programs and membership sites for your WordPress website. It provides a personalized affiliate dashboard that your affiliates can log in to. You can track affiliate’s performance and check clicks and sales. The affiliate program integrates with your shopping cart and it doesn’t require monthly payments or a percentage of the affiliate transaction. It’s easy to set up and integrates with your website’s design. Amazon Auto Links makes it easy to manage your Amazon affiliate links. You choose your categories and it automatically sets up links with your affiliate ID for 10 different locales. You can insert the ads as a widget, as a shortcode, or within your theme’s PHP. Create your own templates, search for specific products, filter unwanted products, and use custom buttons. You can customize the outputs or use custom templates. Set the image sizes, sort order, and use URL cloaking if you want. You can export your ads to external feeds, so you can use them with RSS or with your apps. EasyAzon makes it easy to add Amazon affiliate links from within your WordPress post editor. Create a text affiliate link without having to go to Amazon. They can open in the same window or a new window and apply nofollow if you want. Settings are applied site-wide or on a per page basis. It supports multiple locations. A pro version is available that adds images, product information blocks, Amazon buy buttons, popups, cloaking, add to cart, automatic localization, and support for multiple affiliate IDs. Affiliates WooCommerce Light lets you add your own affiliate program to your WooCommerce website. It has a free version and several pro versions. It integrates the Affiliates plugin with WooCommerce. It creates referrals automatically when sales are made. You set the commission rates. The pro edition includes an advanced integration that synchronizes the referrals with their order status. YITH WooCommerce Affiliates makes it easy to create your own affiliate program with WooCommerce. The plugin adds the affiliate ID to properly credit the commissions. You can create affiliates from your registered users or let them register from a registration page that you create with a shortcode. The plugin manages the affiliates and keeps a running total for each one. Affiliates are provided their own dashboard. You can view commissions, reports, etc. That’s our look at the 13 best WordPress affiliate plugins to add affiliate links or create your own affiliate programs for your WordPress website. The plugins are easy to use and there’s something here in every price range. If you’re interested in using affiliate programs with your WordPress website, whether you’re adding links to your content or sidebars or creating your own affiliate programs, I’m sure you’ll find what you need here. We want to hear from you. Have you used any of these WordPress affiliate plugins for your affiliate website? Let us know about your experience in the comments. The post 13 Best WordPress Affiliate Plugins appeared first on Elegant Themes Blog.